There are literally hundreds, and maybe even thousands, of pet survival kits in the disaster preparedness marketplace. So which one should you purchase? Below we list the top rated pet bug out bags and survival kits according to customer satisfaction reviews and input from industry professionals. We also personally review each item ourselves, and give you our recommendations as to which of the top rated survival kits for your pet would work best in your situation. As the owner of three dogs that I adore, I took special consideration when evaluating the options available for products that are designed specifically to meet the survival needs of my pets. I actually have a special needs dog, so when it comes to my Beagle Molly, I am unable to take advantage of some of the convenient survival products that make prepping for your pets so much easier. However, I was able to review the value and quality of the products with my other two pooches. To evaluate the cat products, I was able to engage my mom’s beautiful Scottish Fold cat. Although Abby acts more like a dog than a cat at times, she was still very helpful in my evaluations. Bug out bags for cats and dogs are the most common pet survival kits. They include water, food, shelter and first aid to get your beloved pet through at least 72 hours of an emergency survival situation. There are bug out bags, survival packages and other gear which are made specifically for your animal to survive a longer-term disaster situation as well. In the case of larger dogs, pet survival backpacks help lighten your personal load, as healthy, strong dogs can carry their survival gear on their back. Due to the sheer number of survival kits designed for pets, we’ve decided to provide information on those destinations that offer the best value and quality when it comes to these products. The links will take you to the pet survival sections of their websites where you will find the kits we’ve determined are premium options for pet owners seeking quality survival care for their pets. Survival Frog is a trusted name in the emergency survival space, and they offer a decent selection of survival kits designed specifically for dogs and cats. Their kits are comprised of quality name brands such as Guardian, Mayday and Aqua Liter, and are comprehensive enough to provide the essential supplies to sustain your pet for short term emergency situations. They offer basic and premium kits for both cats and dogs, as well as pet first aid kits. Their kits offer a nice 5 year shelf life for the food components, which beats standard shelf life for traditional pet food by about 4 years. We have found Survival Frog to be easy to work with, offering efficient and high quality service, and very responsive when we assessed their customer support team. Their prices are competitive and on par with industry standards. They offer a 6 month ‘any reason’ return policy, allowing customers to return products in ANY condition for ANY reasons. They also offer free shipping on all orders over $50. American Family Safety is another one of our preferred sources for securing emergency survival kits and bug out bags for your cat or dog. 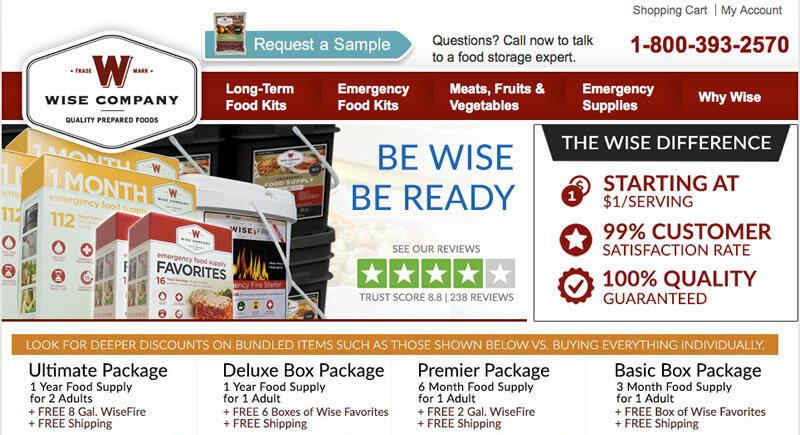 They feature emergency pet food and water rations created by trusted brands with a 5 year shelf life. The survival kits sold at AFS are designed for short term survival needs, and are available for both cats and dogs. 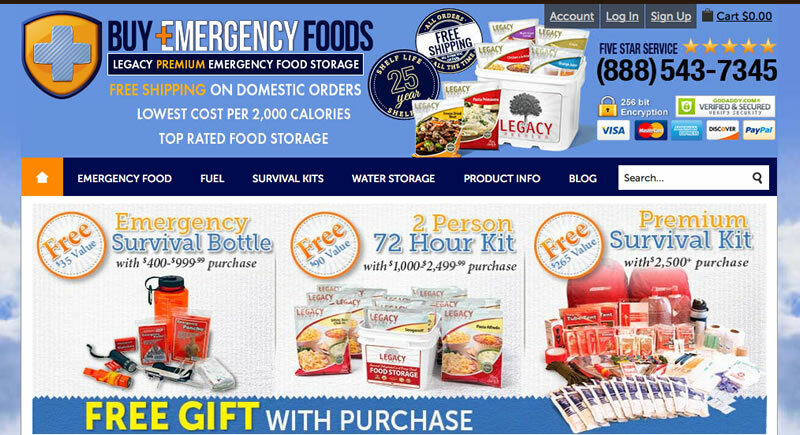 If you are interested in expanding the kit for a longer term purpose, they also sell individual MayDay food and water rations for a great price (cheaper than Amazon and other retailers). You will find that their kits comprehensively cover all essential needs for caring for your pet during an emergency situation. This company has a focus on family, and offers some nice informational resources in their library. As a smaller company they cannot compete with some of the promotional offers of the larger brands featured on this page, and they do regrettably impose a 15% restocking fee on returns, but they are a solid option that delivers quality and efficient service. They are also one of the few brands that allows purchasing of individual food and water rations so you can expand your pet emergency food pantry if you so choose. 1-800-Prepare provides similar pet survival kits as the other retailers you see on this page, however they often have lower prices and are worth checking for that simple reason. Their kits feature the same trusted brands, such as MayDay and Aqua Liter, at very competitive prices. 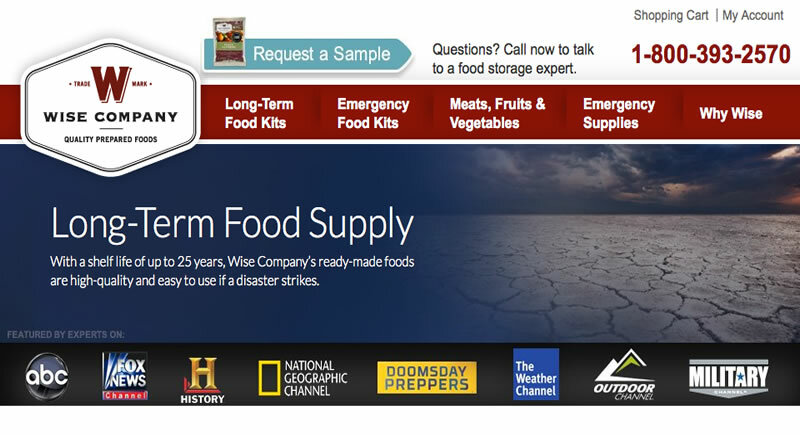 We like working with this company for a variety of reasons, including the fact that they offer some survival products and gear categories that are not always well represented by many suppliers. Their customer support team is knowledgeable and responsive. The downside to this brand is their 20% restocking fee for elective returns. We’re not too keen on that aspect of their merchant policies, which is why although we consider them a solid brand, they are at the bottom of our list. As with American Family Safety, they cannot compete with Survival Frog’s promotional offers, return policy and free shipping options. Of course Amazon needs no introduction or explanation. They actually have a wide selection of survival kits for dogs and cats and depending on the promos being offered at the other destinations. For example, they do not beat the price of individual MayDay dog and cat food or water packages, but they compete nicely on the complete kit options. With their free shipping options, sometimes they come out ahead on pricing. Another perk of purchasing at Amazon is easy returns and access to user reviews. The link below will direct you to the section of Amazon that features all of their pet survival kits and also includes some individual products for kit expansion if you should desire to do that. I’ll be honest, I don’t buy anything at any store (online or offline) without checking the price at Amazon for that product. They don’t always beat other retailers, but its still worth checking out.